Ryan Gosling in FIRST MAN. Courtesy of Universal Pictures. Josh Singer’s screenplays continually make the past feel prescient. Whether the events are considered part of history by mere years (like with his work on SPOTLIGHT), or decades (like with his work on THE POST), he impressively mines the pressing urgency of the situation at hand to tell an engaging, engrossing and entertaining story. They’re typically humanistic portraits of people who’ve gone above and beyond. FIRST MAN is no exception. 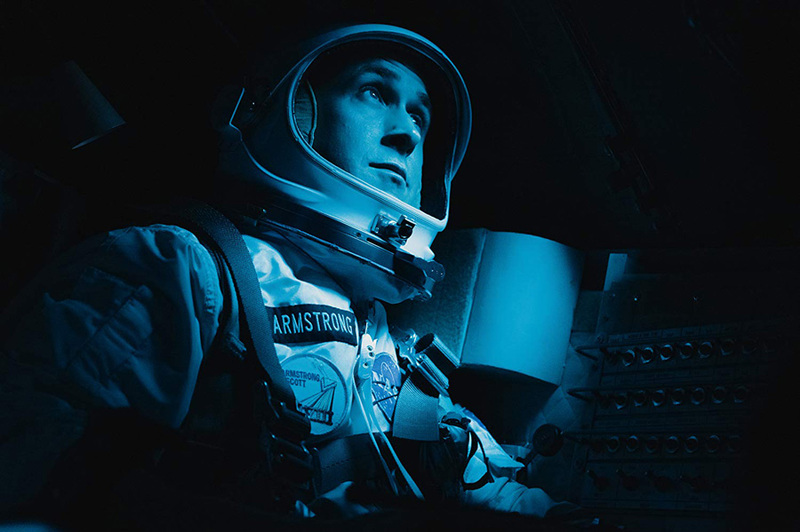 While author James R. Hansen’s biography of Neil Armstrong functioned as a guideline, Singer, along with director Damien Chazelle and actor Ryan Gosling, deliver a haunting, provocative and bracing cinematic portrayal of the legendary American astronaut. At the film’s recent press day, I spoke with the affable screenwriter about everything from discovering the undiscovered, to how they created a gripping narrative when audiences know the outcome, to handling the pressures of getting this hero’s journey right. This film is full of such profound detail. Where did Neil’s arc begin for you? Damien first approached me back in 2014 and he was very taken with the visceral – how dangerous it was, showing it in a way it hadn’t been shown before. I started reading Jim’s book and I was knocked out by how much loss there had been for Neil over this time period. I had not known – as I’m sure most people didn’t know prior – that he had a daughter he lost right before he joined Project Gemini. Most people are totally unaware that he lost two of his closest colleagues within a 12 month period – and it’s within that same 12 month period that he himself almost died in Gemini VIII. This was nothing compared to what the test pilots had gone through in the ‘40s and ‘50s. It struck me there was a really powerful story to tell about loss and sacrifice that was largely unknown to the general public. I became obsessed with that story and trying to get it right. You have Jim’s meticulously researched book as a guide, but how much more research did you feel the need to do? How deep a dive into NASA’s history did you do? A fair amount. Some of it was just trying to understand the technical aspects of Jim’s book. Jim was the first stop, but talking with people like Gene Matranga, who was an engineer and worked with Neil on the X-15, and talking to Joe Engle, who is the last living X-15 pilot, who was a shuttle astronaut, was invaluable. I really had to get into what exactly were we going to be seeing on the screen. How would this flight have gone? Also, going up to Edwards and getting Neil’s pilot notes and pilot comments on that flight was incredibly helpful in getting me some detail about how Neil got distracted and why he got distracted during the flight and how that all went. That’s a good example of trying to do a 360 on the nuggets that were in Jim’s book and trying to go deeper. That was true for every flight he had, whether that was the LLRV, where we talked to Dr. Christian Gelzer – an expert in that – about how they would’ve flown the thing and studying the YouTube clips, which was pretty extraordinary and terrifying. With the Gemini VIII, we got pretty beat up by Dave Scott on our first couple rounds, because frankly, the script wasn’t very good. He helped us get it much better. We had Frank Hughes – head of training for the astronaut program at NASA – and he had great knowledge of both the Gemini and the Apollo and could walk us through those flights. On the personal front, that was where we had to do another round of 360. What was great was that we got to know Mark and Rick [Armstrong] really early on. They read any number of scripts. We spoke to them, interviewed them – spoke to Janet [Armstrong] on a couple different occasions, spoke to June, Neil’s sister, spoke to friends of his and colleagues – trying to really, as well as we could, understand who this guy was. We felt we were making a pretty provocative portrait of an icon. Not many people are aware of the sacrifice and the suffering and what he personally struggled with so we felt if we were going to do that we better get it right on both the technical front and on the personal front. We went pretty deep. A lot of the Neil we see here is someone who’s very contemplative and introspective. One of the scenes that haunts me is when he looks at the Gemini VIII capsule as if it could be his coffin. What does the script look like when writing those types of first-person perspective-driven scenes? I’m glad you asked, because we have an annotated screenplay which is going to go on sale on October 9, where we have, not only the whole screenplay, but we have commentary on every scene. We talk about what’s true and what’s not true, because we want to be very careful with where we took license. We also give other historical detail. Since you asked, we try to talk in some detail about action scenes where there’s no dialogue by describing the scene. This was always what Damien and I were trying to do. There’s a lot of writing – maybe more than typical to put you in that place. Let’s be honest: essentially a script is a blueprint. It’s a blueprint for the studio so they understand what you’re going to be trying to achieve in these scenes and then it becomes a blueprint for your entire construction crew so they can have the same manual to work off of. It’s a blueprint for your production designer, costumes folks, for VFX folks, for the DP. I tend to overwrite, if anything. I do that because I like to be very clear about what I think it’s going to look at feel like. Damien and I worked tooth and nail over this script, for years. We started talking in 2014 and I started working in January 2015. I did a 72 page outline and my first draft was done in October. We worked on it – just the two of us – before anyone really saw it, and that was February 2016. We continued to work on it up to and through prep and shooting. Damien and I are together trying to create this draft that’ll sell what he wants it to look and feel like on screen. We got very detailed since so much of this is about the action of it all as opposed to the dialogue of it all. So much of screenwriting, since it is such a visual medium, is about action and structure as opposed to being about dialogue. Does it feel daunting tackling American history, writing something like this, or SPOTLIGHT, or is it all the same degree of pressure? Maybe you don’t even focus on that at all. Well, look, what attracts me to these stories is that they’re the underside of history. They are parts of history that aren’t particularly well known. Like, I’m sure you know these guys got to the moon. Our challenge – and it is a real challenge – is how do we make the story interesting when you already know what’s going to happen? That’s certainly true for SPOTLIGHT as well. You know they get the story. So what’s interesting about it? It’s gotta be the emotional journey and all the things you didn’t know about how they got it – or why they got it. Why does Neil run as far away from this planet as you can get as he’s trying to deal with such tragedy? To me, there is that challenge, but what I find more daunting in maybe more than this than on any other movie I’ve worked on is you’re dealing with an American icon. You’re dealing with someone who everyone thinks they know and feels ownership over – as they should. Especially when you’re saying provocative things about him…to the astronaut community, these things are provocative to show him crying at the death of his daughter because astronauts don’t cry, right? To the astronaut community, it’s incredibly provocative that we show him in his one mission where he screws up. To the astronaut community, it’s provocative that he was upset at all about Elliott See’s death. They’re just looking at their watch and for their next mission. That’s a part of life. Sure, it was a tough part of life, but it was a tough part of life. In a lot of ways, this is a very provocative portrait. This was another impetus for writing this book. I wanted to be very clear where we were taking license and why. That’s what I get most concerned about. Are we being true to the guy and being true to the history while telling our story? In this case, we were very careful. There’s no question trying to tell this guy’s story is very daunting. I would go so far to say that without Jim’s help, and without the help from all the people Jim put us in touch with, with all the family and colleagues, I would not have felt comfortable going on this journey. How does writing a film like this creatively satisfy you? Good question. Once I’ve got the dragon by the tail and I’m working away… I find the first draft really challenging. I really love revisions, because if you get to know the characters, it’s just getting to go and play with them. I tend to write lots of drafts and never particularly mind it. I will say that what I find most fulfilling about this journey is what I learned in trying to uncover these stories – specifics you pick up on as you go through. There’s a moment at the end of SPOTLIGHT where we learn that Eric MacLeish had brought the story to their attention in ’93 and it had been buried. That was something Tommy [McCarthy] and I were not told by anyone. It was something we uncovered talking to Eric MacLeish and looked back and found that article and had to go talk to Robby [Walter ‘Robby’ Robinson] about it. It’s, in some ways, what makes the larger point of the film. Obviously Robby and them are all heroes, but the point of the film is deference – why did it take so long to get it? Because of deference. Uncovering that piece of history, in the same way I feel here, like with the help of Mark and Rick and the Armstrong family and so many others, we’re hopefully going to puncture the meta-narrative that this was easy or that these were superheroes. No, these were ordinary American families working pretty hard and sacrificing a ton. To me, being able to give that shade and puncture that narrative and the relationships I get to form along the way… I still talk to Marty Baron and Rob every chance I get. I feel blessed to have gotten to know them and learn from them. I feel the same way with Rick and Mark Armstrong, Frank Hughes and Joe Engle. The things I do, while terrifying at times, are quite fulfilling. FIRST MAN opens on October 12. You can pre-order the annotated screenplay here. Win a copy of SKYSCRAPER starring Dwayne Johnson on Blu-ray!